The short story is AAPL set all-time closing highs on Thursday and Friday, closed at $274.07 this week, and was up +$20.56 for the week as iPhone 4 Mania Ruled. Current Apple News & Fundamentals are discussed here. Below is a technical review of AAPL stock. The long story is AAPL is up +8.11% for the week, up +6.69% for the month, up +30.06% for the year, and up an amazing +229.77% since the March 9, 2009 market bottom. This equates to +$20.56 for the week, +$17.19 for the month, +$63.34 for the year, and an incredible +$190.96 since the March 9, 2009 market bottom! 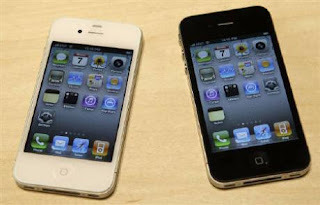 In addition, Apple has topped the previous 2010 YTD, and all-time, high, of 270.83 on April 23. By comparison, the overall market, the S&P 500, is up +2.37% for the week, up +2.58% for the month, up +0.22% for the year, up +65.18% since the March 9, 2009 market bottom, and down -8.22% from the 2010 YTD high on April 23. AAPL is outperforming the overall market. A review and weekly update of Apple Inc. news and fundamental analysis is in the previous post. A review and weekly update of USA and World market and economic news and fundamental analysis is here. Overall, the USA and global economic data remains cautiously optimistic and fears about Europe have eased some. AAPL: iPhone 4 + iPad 3G = Apple All-Time High! The intermediate-term signal, the comparison of the 25 day and 50 day simple moving averages, generated a sell/short/bear signal on Thursday, June 10. AAPL had been in a bull market since March 12, 2010. Subsequently, the 25d sma and 50d sma are approximately the same, which makes this signal neutral. Currently the 50d sma is slightly higher than the 25d sma. There is no resistance because AAPL is at an all-time high. Since AAPL is at an all-time closing high, there is plenty of support below. The most notable support would be the previous rally and all-time high of 270.83 on April 23. AAPL above the all the simple moving averages. noted on the chart: 25d, 50d, 100d and 200d. The 25d sma is just below the 50d sma. The 25d sma and 50d are ascending. The 100d and 200d sma's continue to ascend. The yellow uptrend line, a rate of price ascent, is from the AAPL January 20, 2009 closing low of 78.20 up through the February 4, 2010 closing low of 192.05. The February 4 closing low has been the bottom for 2010. AAPL spiked decisively above this uptrend line on February 24. 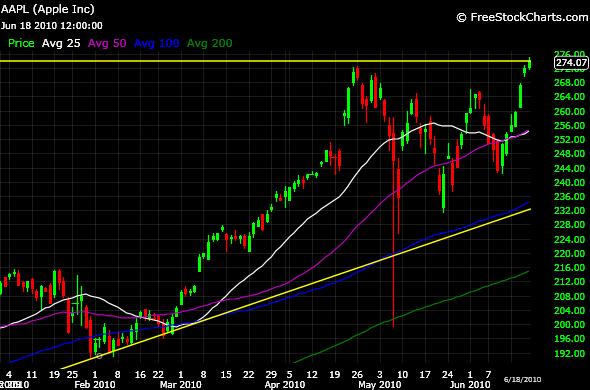 AAPL has now stayed well above henceforth (except for Flash Crash Thursday, May 6, 2010). The higher downtrend line, a rate of price descent, from last week has been negated by the all-time closing high of 274.07. The lower downtrend line, a rate of price descent, from last week has been negated by the all-time closing high of 274.07. The MACD flipped to bullish on June 15 and is uptrending. At +2.17 this is near the peak of +2.49 on March 10. That was the highest since November 4, 2008 and +3.41. The 10 month exponential moving average of 223.97 is a long-term trend indicator and shown on the monthly chart below. That is the line in the sand, so to speak, for the long term signal of a bear market. 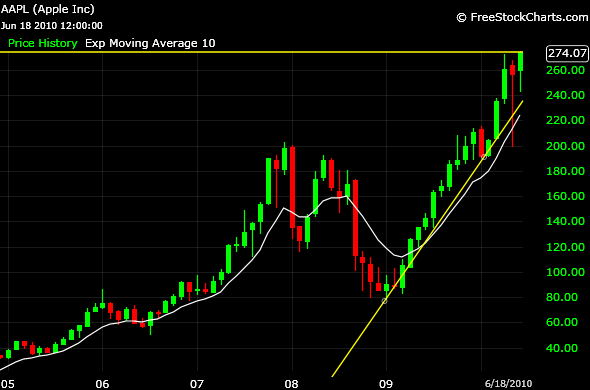 AAPL is well above this signal at the current close.AAPL is in a long-term bull market and has been since April 2009. Through disappointing USA economic data such as the May jobs report, the overall market pullback, uncertainty over the USA economic recovery, the Flash Crash, and the EU & Euro Crisis, the fundamentals at Apple Inc. never changed. The fundamentals of Apple are actually improving and are reviewed in the previous post. Apple Inc. is doing great! AAPL has been struggling with the overall market downdraft and when the market upticks, Apple breaks loose. Apple has been charging ahead with the introduction of the iPad, iPad 3G, a iPhone 4, iOS 4, and a new mobile advertising platform (iAd). iPhone sales and market share are impressive and now reports of very strong iPad demand (including the international launch in May). iPhone 4 demand may well be astronomical. The current price is now catching up with AAPL fundamentals. The RSI 14 day and 28 day are reasonable. The MACD had been flipping back and forth on the lack of a clear AAPL price trend previously. The intermediate-term trend is neutral to bullish. The long-term trend remains bullish. Follow The Osprey Port Network On Twitter! Google Blogspot is acting up this weekend, so some line spacing and other formatting is out of whack. Apple to the moon !! !